Yellow Ostrich was the first band I saw last year, at this same venue (Mercury Lounge). Back then, the band consisted of creative mastermind and frontman Alex Schaaf and drummer Michael Tapper, working hard to produce an on-stage re-recreation of the simple magic of the band’s then-current release, The Mistress. That record was one of those indie gems you might miss if you didn’t pay attention to the CMJ showcase circuit and the right blogs; it was a lo-fi, low-profile recording offered on Schaaf’s bandcamp page for free, and it was as simple and unadorned as a record could get. That sold-out show found Schaaf still finding his footing creatively and and as a performer; he was still a bit raw, but already compelling. The Mistress and its stellar reviews attracted wider notice, as good records tend to, and Schaaf signed to the Northwest imprint Barsuk Records, who obligingly remastered and re-released The Mistress, along with bankrolling the band’s new release of last month, Strange Land. Since that Mercury Lounge show last January, Schaaf has performed around the country in front of hundreds of audiences, and the band has added a critical third member, Jon Natchez, who has played with Beirut, Camera Obscura, Okkervil River, and The Antlers. What was once your favorite little indie bedroom project has grown into a full-fledged rock band with the songs to prove it. This sold-out Mercury Lounge show was a valedictory one for the band, coming on the heels of a U.S. tour that took them to all corners of the country, not to mention its great middle (Wisconsin is where Schaaf calls home, and they have a serious following in flyover country). Not only are the standout tracks on Strange Land like “Marathon Runner” and “I Got No Time For You” already in top form, but older tracks like the quirky “WHALE” that first drew me to the band have been reworked with more layers of sound. Schaaf’s sweet, somewhat nasal voice and quirky songcraft have always recalled, for me, innovators like John Darnielle and Jeff Mangum. Schaaf, like Darnielle, has found a way to embrace a full-bodied, at-times-lush rock sound without losing the qualities of his music that make it unique. It’s appropriate, then, that he closed the set with one of the simplest and most plaintive tracks off of The Mistress, “Mary”. Even with all his new musical toys, Schaaf can be a pretty damn compelling performer without them. I recorded this set in the same manner as I recorded Yellow Ostrich last year, with Schoeps MK41 microphones and a perfect soundboard feed from the Mercury Lounge head FOH. The sound quality, as with the last recording, is outstanding. Enjoy! Check out Yellow Ostrich on tour this summer with Los Campesinos! and at several festivals (including Lollapalooza). Their next NYC dates are June 21 at Maxwell’s, June 22 at Le Poisson Rouge and June 23 at Brooklyn Bowl, each with Los Campesinos! 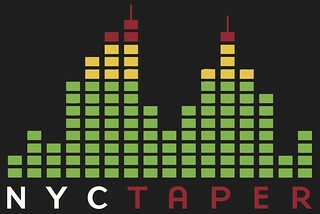 Thanks to the band for their support of NYCTaper. If you enjoyed this recording, PLEASE SUPPORT Yellow Ostrich, visit their website, see them on tour with Los Campesinos! and at the other festivals they’re playing this summer, and purchase Strange Land and The Mistress directly from Barsuk [HERE].